Today is the 48th anniversary of the National Chicano Moratorium protest which began August 29, 1970 in East Los Angeles, which attracted as many as 30,000 people to protest the drafting of young Mexican Americans into the Vietnam War. In this photo we see an African-American student in the very front lines, holding the National Chicano Moratorium banner at the front of the parade, while a young Chicano holds it on to the other side of the banner. On account of the lack of educational and vocational opportunities extended to Mexican Americans because of persisting racial discrimination of that era, our people were most often being denied deferments from the war. And consequently it became clearly evident to the public that our brown-skinned young people were being disproportionately sent to the front lines as cannon fodder for this war. So in the face of this reality, our people began to protest. They fiercely organized when they realized that Latinos accounted for about 20% of the wartime deaths in Vietnam while making up less than 5% of the population of our country at the time. The protest was organized by local college students and activists from the Brown Berets. However, it should be noted that the National Chicano Moratorium had a multi-racial backing and presence on the front-line of this protest. As you will see in pictures and film from the events, there are also black and white people standing in solidarity with the Chicano anti-war movement. In the police violence that ensued, Ruben Salazar, then the news director of KMEX Channel 34 and a Los Angeles Times columnist, he would be killed by the sheriff’s department. However, our dear Ruben Salazar would not be the only death in the actions known as the moratorium, actions which raged for months; there would be four deaths in total; among the dead were three other people. One is Lyn Ward, who was a Brown Berets “medic” who was killed when a burning trash can containing combustibles exploded; and also another Chicano simply identified as José “Angel” Diaz. And the fourth fallen person was a person who did not identify as a Chicano at all. In-fact the oral legends and passing historical accounts identified him as a Jewish college student from East Los Angeles. I have spent a few years investigating this account, trying to authenticate this story. What I have found out is that while this story might be true, it seems that it might have at least one fact wrong. The student is identified as a Sephardic Jew; and to some eastside people this would have seemed to have made sense to them as to why he might join in such a movement; if he was a Jew of Spanish extraction. Though as a Sephardic Jew myself, this doesn’t sound exactly right. The name Gustav Montag, both the first and last name, suggests that he was actually an Ashkenazi Jew, of German Jewish roots. And I can tell you with great certainly that we did have Ashkenazi Jewish families by the name of Montag who had lived in the area for many years; some buried in East Los Angeles Cemeteries. So it appears to me that this mysterious martyr of the National Chicano Moratorium was quite possibly not a Sephardic Jew, as the urban legend tells the story, but instead a white Ashkenazi Jew; a white Jewish young man who joined in the solidarity with the Chicano movement, as leftist Jews had since Chicano student organizing began back in 1963. Dead: Gustav Montag, Jr., 24, a native of Sternowitz, Austria, who lived with relatives at 2208 Tuller Road. A spokesman for the Sheriff’s Department said he was evidently struck by a ricocheting gunshot pellet that pierced his heart. In the past couple years I have asked around quite a bit, though I have not yet been able to locate the resting place of the martyr Gustav Montag. I hope to one day be able to fill in the details of this story, and pay my respects at his resting place if such a site exists. Rest in power martyrs of the National Chicano Moratorium… Ruben Salazar, Lyn Ward, José “Angel” Diaz… and our Jewish brother Gustav Montag. Note: In this film “Chicano Moratorium: A Question of Freedom“, by Loyola-Marymount film student Tom Myrdahl which captures the events, it opens with my dear friend John Ortiz, que descanse en paz, marching with pride on the horizon of change. John passed away this passed year. Rest in power, our friend and “professor”! 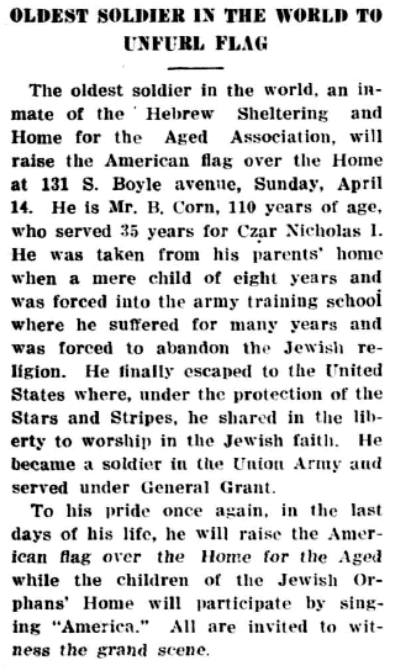 “The oldest soldier in the world, an inmate of the Hebrew Sheltering and Home for the Aged Association, will raise the American flag over the Home at 131 S. Boyle avenue, Sunday, April 14. He is Mr. B. Corn, 110 years of age, who served 35 years for Czar Nicholas I. He was taken from him parents’ home when a mere child of eight years and was forced into the army training school where he suffered for many years and was forced to abandon the Jewish religion. He finally escaped to the United States where, under the protection of the Stars and Stripes, he shared in the liberty to worship in the Jewish faith. He became a soldier in the Union Army and served under General Grant. There are many Jewish people who came to the United States as veterans of the czarist army. There were also many people who came to avoid being drafted by the Russians army. At the time that Mr. Corn was drafted, any male between the age of 12 and 25 years old could be conscripted for a standard service of 25 years. On account of the extremely long conscription, some Russian Jewish young men cut off their trigger finger to avoid being drafted. I have several friends who clearly remember their grandfather thus having one shorter finger; though people rarely mentioned the reason why. However, Mr. Corn was like many Jews who did service in the czarist Imperial Russian Army, where he suffered greatly. The Gless House was the early location of the Hebrew Sheltering and Home for the Aged, located at 131 S. Boyle Avenue. It’s amazing that after all that, while advanced in years he served in the righteous ranks of the Union Army, to put down the Confederate slave-state rebellion and defend the freedom of the United States. It’s also very touching that as Mr. Corn raised the flag over the Jewish Home for the Aged, which at the time was located at the old Gless House, where he had become a resident. While the choir was led by children from the Jewish Orphans Home, which at the time was located in a boarding house across the street from Hollenbeck Park. The children in the choir would have been around the age he was when he was taken into the czar’s army. And one of the common Eastern European Jewish family stories is the epic of how their family members or ancestors were sent away lest they be taken by the czarist Russian army. Today, I ask us to consider the life of a Russian Jewish boys who were subjected to the czar’s draft in the 19th century. This was a real and terrifying concern. Czar Nicholas I ordered that the Russian draft into the Imperial army also apply to the Jewish communities in 1827. At that time the scare of conscription was extended to potentially affect every single young Jewish boy. Though it is important to note that it wouldn’t have been the Russians who would have selected and taken the young Jewish boys… it’s a bit more complicated than that. The terrible task of selection was done by the “kahal,” by the Jewish community body. And it was them who handed the young boys of their community over to the Russians. And because of this authority of selection being in the hands of the men of the community, it happened that a disproportionate amount of those selected were children. This was further justified based on the idea that these boys didn’t yet have a family and dependents to support. So the younger ones were often sent instead of the more mature youths. And when young men could not be found to fulfill the quota, they would start to take boys as young as eight years old, and sometimes even younger. Taking these boys from their families, the kahal would often employ their own informants and send “khappers” (kidnappers), to steal these Jewish boys before they could be hid or sent away by their family. They were then taken by the community and handed over to the army for 25 years. Some 30,000 to 50,000 Jewish children were taken to be conscripted into the cantonist army schools and prepared for service in the Imperial army. Though Jews were drafted into the army, they were limited in the roles they could serve. Only 8 people are known to have risen above Russian racial nationalistic policies. Most often the boys were deprived of their Jewish practice and pressured to convert to the Russian Orthodox Church. And some did – as much as one-third of the young Jewish boys converted to Christianity – for better treatment and opportunities. Though many more struggled to maintain their Jewish identity under impossible circumstances. In 1856 this policy would be abolished by Czar Alexander II, thought it would take a few years to entirely abolish the canton policy. All unconverted young men under 20 years old were then given back to their parents. All those who had converted were given to their Christian godparents. The liberation of the Jewish boys drafted into the cantons would have be undone just a few years before Mr. Corn would have joined the Union Army and served under General Grant during the American Civil War. A lot of people have history of their ancestors suffering from, or fleeing conscription. Then later on Jews would also have to deal with fears of Russian Army conscription during the communist revolution. And at that time would send Jewish young men abroad, some of which would come here to America. We would start to get a lot more Jewish Russian army veterans here in Los Angeles in the first couple decades of the 20th century. 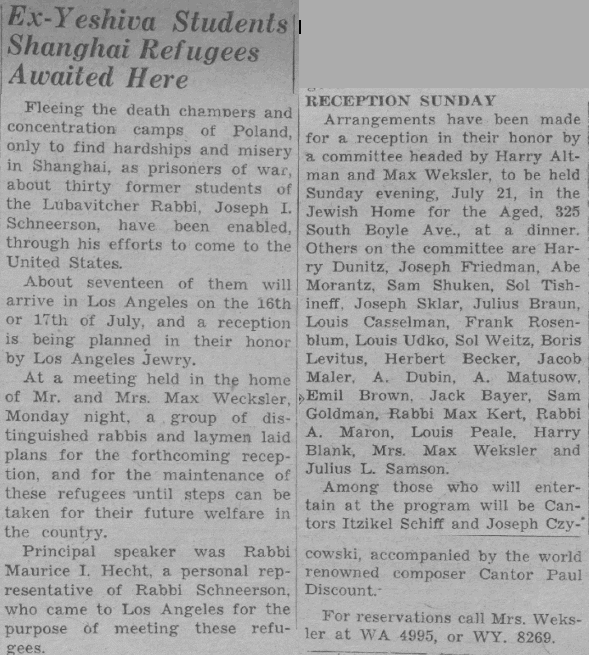 “Fleeing the death chambers and concentration camps of Poland, only to find hardships and misery in Shanghai, as prisoners of war, about thirty former students of the Lubavitcher Rabbi, Joseph I. Schneerson, have been enabled, through its efforts to come to the United States. 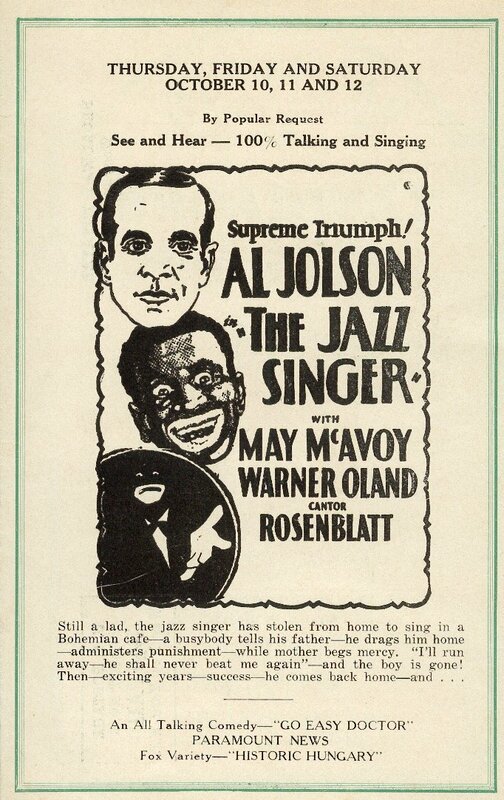 “About seventeen of them will arrive in Los Angeles on the 16th or 17th of July, and a reception is being planned in their honor by Los Angeles Jewry. “At a meeting held in the home of Mr. and Mrs. Max Wecksler, Monday night, a group of distinguished rabbis and laymen laid plans for the forthcoming reception, and for the maintenance of these refugees until steps can be taken for their future welfare in the country. “Arrangements have been made for a reception in their honor by a committee headed by Harry Altman and Max Weksler, to be held Sunday evening, July 21, in the Jewish Home for the Aged, 325 South Boyle Ave, at a dinner. Then it gives the names of the people on the committee. The students had been studying at the Chabad-Lubavitch Yeshivas Tomchei Temimim in Otwock, a suburb of Warsaw, when Nazi troops invaded Poland in September of 1939. Refugee yeshiva students arrive in Shanghai, China. Together the group of yeshivah students, managed to make it to Lithuania, where they obtained transit visas from diplomat Chiune Sugihara, Japan’s consul in Kaunas (Kovno), enabling them to cross the Soviet Union and spend the war years in the relative safety of Kobe, Japan and Japanese-controlled Shanghai, arriving in 1941. There they would suffer much hardship – the exhaustion of the journey had worn them down. And then they faced years of being held as prisoners of war, suffering from everything from the extreme change in climate to food poisoning. They were then liberated finally after the end of the war in the Pacific. After the war they would come to America by way of Los Angeles in 1946, to be welcomed and given support as they came to establish themselves in this country. Though one of those refugee students would play an important role in establishing the Chabad-Lubavitch movement in Los Angeles. In 1948, Rabbi Shmuel Dovid Raichik would be sent by the sixth Rebbe – Rabbi Yosef Yitzchak Schneerson, of righteous memory – who assigned the newly-married scholar to Los Angeles as his representative in California. Notably, Rabbi Raichik would be one of the disciples of the sixth Rebbe who would plead with Rabbi Menachem Mendel Schneerson, of righteous memory, to become the seventh Lubavitcher Rebbe. Rabbi Raichik would be given the mandate by the Rebbe to not just focus on building up one synagogue in the city of Los Angeles, but to spread out across the entire city and surrounding area. Today Chabad-Lubavitch is one of the most widespread Jewish movements in greater Los Angeles. 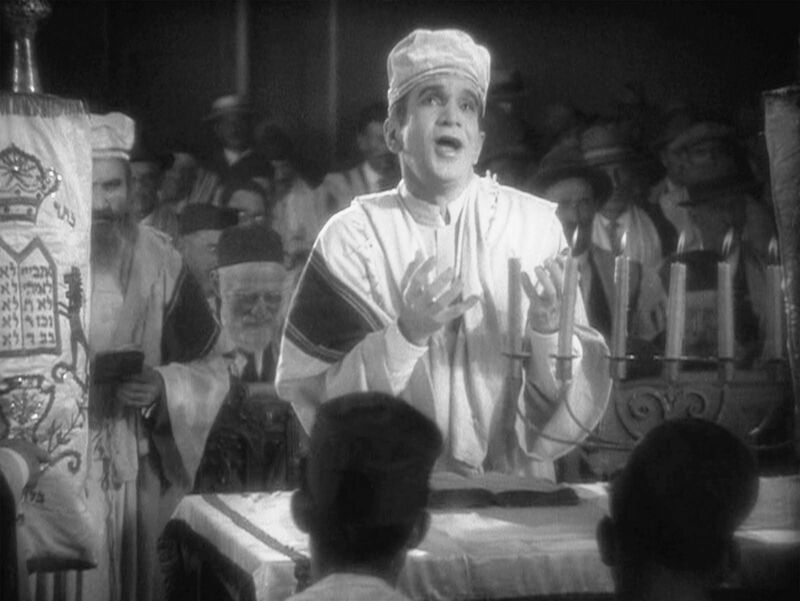 Bonanza in a Box: How a Passover Tradition Became a Hollywood Hit – In 1948, almost nobody in L.A. knew about shmurah matzah; that was before Rabbi Raichik. Now everybody wants it. Now let us take a look at the life of the Japanese diplomat who came to the rescue. And also take a peek at a monument in downtown Los Angeles which honors the hero of this story. The Talmud states: “He who saves one life, saves the entire world.” This verse is written on the base of this monument to Chiune “Sempo” Sugihara – you will find it right next to a Starbucks off Central Avenue in Little Toyko, just over the river in downtown Los Angeles. Chiune “Sempo” Sugihara Memorial, Little Tokyo, Downtown Los Angeles. The statue was a gift of public art from the Neman Foundation and Levy Affiliated Holdings, LLC, honoring this hero. “Sempo Sugihara was a Japanese diplomat stationed in Lithuania who issued thousands of transit visas to Jewish refugees of the Holocaust. Though he did not have authority from the Japanese government to do so, Sugihara is said to have saved approximately 7,000 Jewish refugees though his efforts. “Sugihara was posted in Kaunas, Lithuania in 1939. At the time, the Japanese government required that transit visas only be granted to those who had sufficient funds, and who had also procured an exit visa from Japan. “Seeing the desperate condition of the men and women who came to his office, Sugihara, a low-level bureaucrat, disobeyed orders dispatched from the Japanese Foreign Ministry and issued visas anyway. “From August to September, 1941, Sugihara worked 18-20 hours per day, creating the same volume of visas each day that would have ordinarily been issued over the course of a month. Even as his office was shut down and he was leaving Kaunas, he threw visas to refugees waiting on the train platform. “After the war, Sugihara was asked to resign from his post by the Japanese Foreign Office. It is unclear whether this was a punitive action, but nonetheless Sugihara spent the rest of his life working menial jobs, and settled in the Soviet Union for many years. He was eventually recognized for his efforts in 1985, and named ‘Righteous Among the Nations‘ by Yad Vashem. Chiune Sugihara died in 1986, largely unknown in his native Japan. This is some deep history here. Chiune “Sempo” Sugihara faced great danger. He didn’t just follow orders when he saw Jews suffering, he did everything he could to save them. He came to the rescue of so many Jewish people whose lives hung in the balance, even though it endangered him and his family. And on account of his defiant act, he would lose his career in the end. And though when he died he was virtually unknown in his own country, he became well honored posthumously by the Jewish people all around the world. Every time I am in Little Tokyo I see people pass this statue. Most people I know, even those who are normally in the know historically, they often miss this one. So I regularly find myself pointing it out to friends. And now each time you pass, I ask you to remember how a righteous act by this Japanese diplomat half a world away would help Jews fleeing the Nazi find shelter in Japanese territories. And consider how his act of salvation of just one of these fleeing yeshiva students would benefit chassidic orthodox Judaism in Los Angeles so much. Imagine what stories might be told of the other thousands of people Sugihara rescued! March 23rd is National Tamale Day – At one times the tamal – and its closely related north of the border variation known officially as the tamale – was a treat as all-American as the hot dog and hamburger, and could be found on street corners across the entire country by the end of the 19th century. This is “The Tamale” in East Los Angeles, which opened in 1928. It is shaped in the popular shape of tamales at the time. EAST LOS ANGELES- “The Tamale” was built in 1928. It’s an example of programmatic architecture – where buildings are made to attract customers, often looking like what they sell inside. This building is no longer a restaurant. It has changed hands many times, and has been used as a hair salon and even a dental office. It was recently up for sale. Sadly, it is not land-marked for preservation and there are limited protections because of its location outside of the City of Los Angeles, located in unincorporated Los Angeles County. The shape and wrapping of this tamale was a result of the process becoming automated by the California Chicken Tamale Co. in 1892; giving rise to the San Francisco style tamale. The automation of tamale making would also give an interesting uniform shape to our local XLNT brand tamales, founded in 1894, which had a plant located off of Washington Blvd. in Los Angeles. This machine-made process not just made them easier to make, it also made it possible to produce and sell across the country. In 1892 the founder of California Chicken Tamale Co. would take his product first to Chicago, where it would be met with great success. And eventually make their world debut during the 1893 World Columbian Fair in Chicago, and would proliferate as a craze across the country. Now back in Los Angeles tamale carts managed by street vendors had existed as far back as anyone can remember, the presence of tamales here stretching back to the Spanish-Mexican settlement of the area. And by the start of the 1890s in the American-era, even before they had become well-known elsewhere, tamale carts had already begun to take their place at the old Placita. These tamale carts were essential to laborers, residents, migrants… and even the frequenters of saloon nightlife, they depended upon them. In time they even came to service the local working-class anarchists and socialists who held meetings close by. This certainly made them a target by local business owners and politicians. And eventually tamale carts were banned from the Placita in 1924. 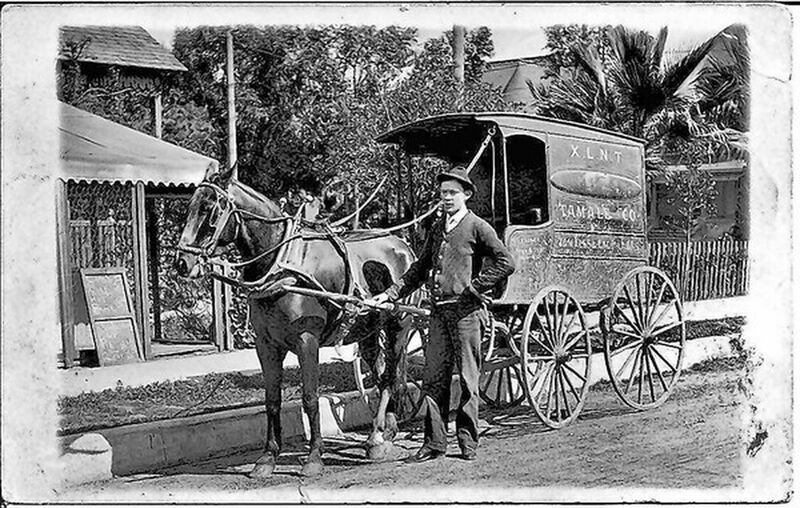 XLNT Tamale Cart – One of the original tamale carts of Los Angeles. Founded in 1894, they have been using the same recipe since 1906. 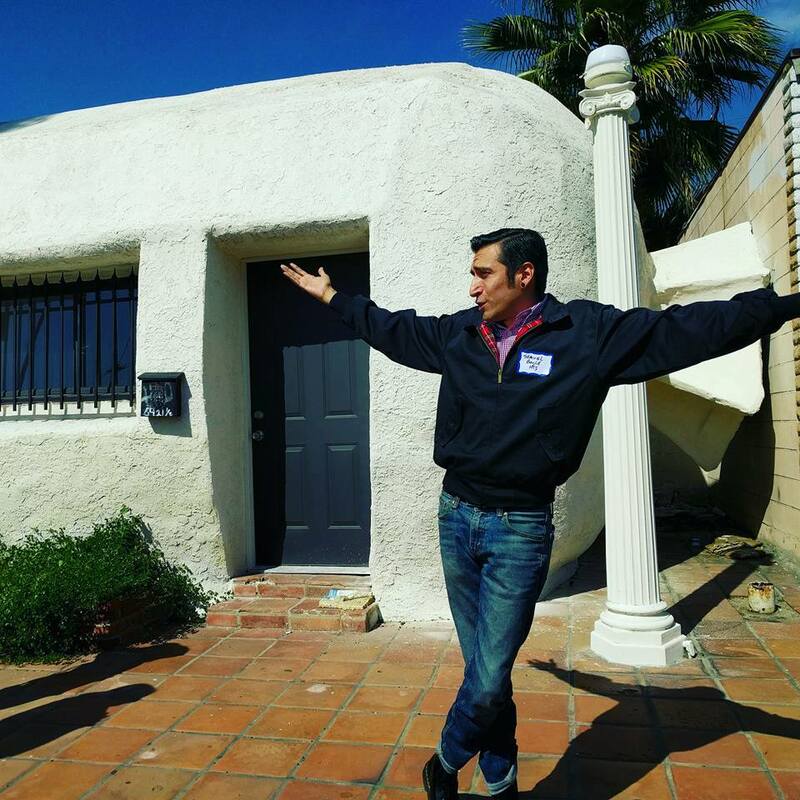 Then just a few years later in 1928, in a wide and open stretch of what is today known as Whittier Blvd., in the unincorporated territory of East Los Angeles, this tamale structure in the tradition of programmatic architecture arose. Offering a diner-like experience in which to enjoy tamales. Now notice the items that they are serving here in the tamale cafe. They are serving tamales; as well as chile con carne. Most likely both of them were provided by XLNT, one of original tamale carts which started a successful tamale empire in Los Angeles; making the tamales and the brick chile base. In the style of the time, the tamales were often served unwrapped and with chile con carne spooned over the top as a sauce. This “hot tamale” style is still a popular favorite with some old school Angelenos to this day. This building is an interesting look at a fascinating period in Los Angeles history, indeed American history. I hope that one day The Tamale is historically land-marked and preserved! In Los Angeles street vending has had a big influence on our local food fare. Many immigrants made ends meet by food vending, not just Mexicans; but Shiks, Pakistanis, and African-Americans as well. And by the end of the 19th century tamales were already one of the hottest selling items across the country. Now what can be more American than that, and also more Southern Californian? Oh and by the way, the actor who played the Mexican pulled off the part, he had the look and accent down, almost like he had come from the barrio himself. 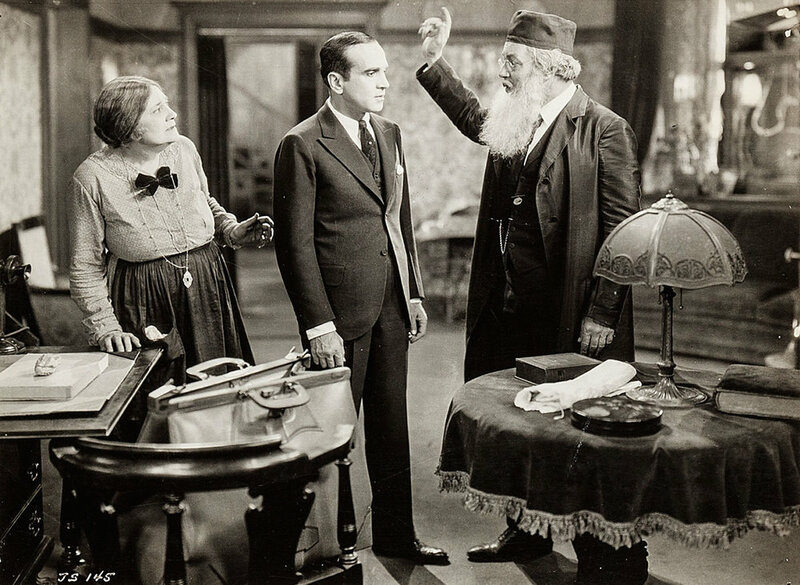 The part was actually played by a Canadian-born Jewish actor named Jack Kruschen. Did you know it’s National Brotherhood Week? In khudsh februar vert gefeyert bey aundz in land di vokh fun briderlekhkeyt. 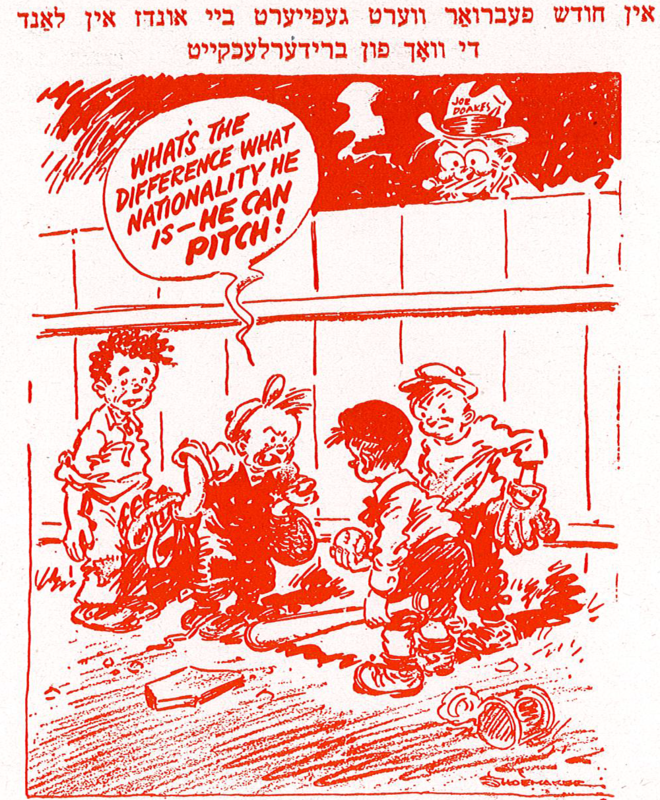 “Yungvarg”Magazine (1949) – This is a cartoon titled “Briderlekhkeyt (Brotherhood),” from the Yiddish youth magazine of the International Workers Order (IWO). Did you know that we are about to come out of National Brotherhood Week? Actually, it should be the time for observance of national brotherhood week. It used to be recognized and celebrated as such… until it was discontinued a few decades ago in the 1980s. Though I am among those who contend that we need to bring it back! In 1934 an organization known as the National Conference of Christians and Jews – which was an inter-faith and inter-cultural organization founded in 1927 to “bring diverse people together to address interfaith divisions” – they came up with the idea for Brotherhood Week. 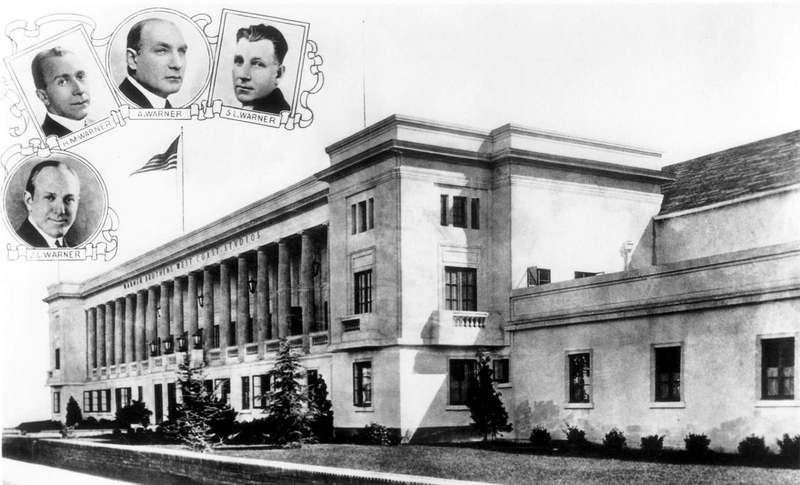 The NCCJ was an organization founded back in 1927 in response the racial nationalism that was rising up in the country, and specifically to respond to the anti-Catholic religious bigotry which at that time had injected itself into the national politics when Catholic politician Al Smith was running for the presidential nomination of the Democratic Party. In 1927, The New York Times reported on the founding of the National Conference of Christians and Jews, represented by community leaders from different faiths including US Supreme Court Chief Justices of the United States Charles Evans Hughes, a Catholic; and Associate Justice Benjamin N. Cardozo, a Jew; as well as the “mother of social work” Jane Addams. Their members were committed to bringing diverse people together to address interfaith divisions, race relations, and social and economic barriers between people of different faiths, cultures, and ethnicities. And for decades they organization would continue to partner Jews and Christians in both public policy and inter-community bridge building. The rise of Brotherhood Week would be because of the work of three of their spokesmen known as “The Tolerance Trio” – Father John Elliot Ross, Protestant minister Dr. Everett Ross Clinchy, and Rabbi Morris Samuel Lazaron. 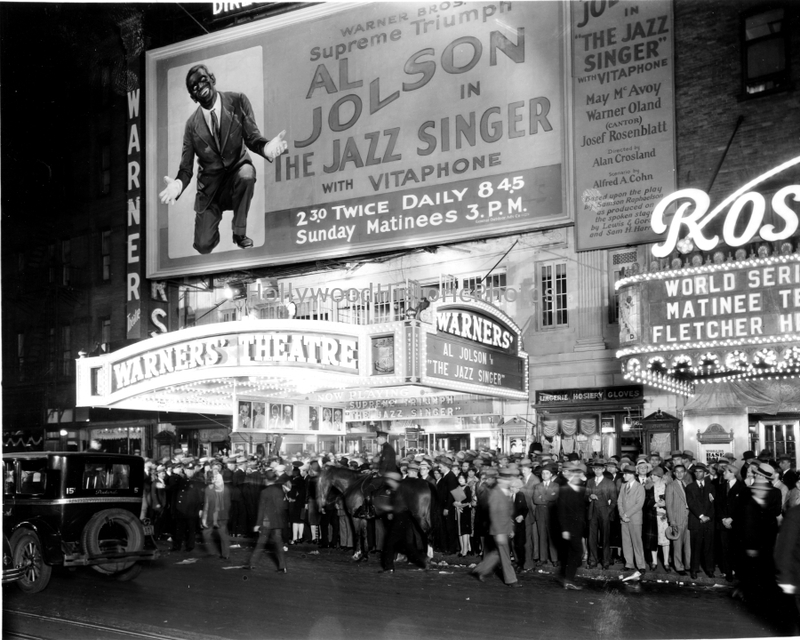 In 1933 they traveled across the country to rally people together and calling on people everywhere to embrace intergroup understanding. They traveled over 9,000 miles on their mission of brotherhood, and visited with 129 audiences across the nation. The spirit of all this caught wind of the administration of President Franklin Deleno Roosevelt. The next year in 1934, the president made an official declaration for “National Brotherhood Week.” Which was to be celebrated towards the end of the month of February; in the 1930s it seems to have been the third week of the month, and by the 1940s it seems to have been celebrated in the fourth week of the month (February 19-28th). Brotherhood Week (February 19th to 28th, 1943) declaration, this year’s statement in the context of the conflict of World War II. In declaration of this observance President Roosevelt was declared its first Honorary Chairman of National Brotherhood Week. And the NCCJ would continue to sponsor it for over four decades. However, since the Ronald Regan administration, there has not been any declaration for Brotherhood Week. We have not been able to look to our leaders to set even one week aside to focus on promoting brotherhood in our country, not for the past three decades. And we are all the worse off for it. Indeed much racial and religious intolerance has injected into politics in recent years. As nationalism and bigotry again raised their ugly heads. We need such a week of focusing on brotherhood and sisterhood in our communities. I also believe that we desperately need to revive partnerships after the model of the National Conference of Christians and Jews once again. Though the NCCJ newly re-branded themselves in the 1990s, their work in communities had already been the bread and butter of the work of the NCCJ for decades. For instance, what is often under-appreciated is the crucial work which the NCCJ did working with youth in Los Angeles. In 1956 they created ANYTOWN USA, a diversity and human rights camp which brought youth together from various parts of the city. ANYTOWN was originally created by the NCCJ-Los Angeles chapter to help Los Angeles area schools address desegregation; becoming the experts in providing essential anti-bias training. Though I am told by my friend Miguel Duran, a former veterano gang leader in Boyle Heights turned expert in gang intervention, that the NCCJ would also play an important role in addressing the “anti-social behavior” we know as gang violence. It would bring cholos from East Los Angeles, black gang members from South Central, and even ruffian white kids from Beverly Hills; all to focus overcoming social barriers and empowering youth leadership skills. ANYTOWN by all measures was a great success. So much so that it was eventually replicated first in Arizona, and then in over 64 cities and regions across the country. According to Duran, ANYTOWN USA would have great successes through their diversity camps from the 1950s and early-1960s. Though their work would start to become thwarted and challenged by Los Angeles civic leaders who fearfully insisted that youth needed to be kept in their own communities after the explosions of the 1965 Watts Riots (meaning they wanted youth of color to stay in their own neighborhoods); and so they at that time turned against such programs based on new social theories which rejected the benefits of group interventions. However, the program would continue to be modeled, and still exists in other cities across the country. So what is the legacy of the NCCJ today? In 2005 the NCCJ national organization was dissolved, however some of their regional offices continued to operate independently, under names which are more reflective of their regional identity. However, several of the former NCCJ chapters are still connected through a loose national organization know as National Federation for Just Communities (NFJC). In our region there are two NFJC member organizations: The California Conference for Equality and Justice in Long Beach, California, and Just Communities, CA Central Coast in Santa Barbara, California. In 1967 Tom Lehrer of piano and satire song fame in the 1950s and 60s recorded a song called, “National Brotherhood Week.” A song which People Magazine called, “perhaps one of the most lacerating and hilariously trenchant pieces of musical satire ever… Lehrer’s deft skewering of the idea of a week established to promote unity in a country where the KKK was still lynching people was decades ahead of its time and earned him as many detractors as it did fans.” Tom Lehrer stopped performing in the US in the 1960s, and later became a popular teacher of musical theater and mathematics at UC Santa Cruz. He is also often credited as being the inventor of the Jell-O shot cocktail. The neighborhood of Pico Union one of the most important immigrant, working-class communities in the city of Los Angeles. In the shadow of downtown and overlapped with the adjacent garment district, most of the residents of this inner-city are Central American working-class families, as well as hard-working Korean and African-American families. ¡Vida Sana! Pico Union Project Community Wellness. Giving out free fresh produce from the farmers markets and providing resources for healthy living; every 2nd and 4th Thursday of the month from 2:30pm to 4:00pm @ Pico Union Project, 1153 Valencia St, Los Angeles, CA 90015. And in this neighborhood of Pico Union, on the corner of 12th Street and Valencia there stands a grand old synagogue, the original location of Sinai Temple, founded in 1909; the oldest standing synagogue in the city. Today it is the Pico Union Project (PUP), founded by Jewish music sensation Craig Taubman, when he purchased the building a few years ago and restored it to use as an interfaith house of worship and multi-cultural community center. A community center where we bring together diverse partners from different cultures and faiths to serve the needs of the community in so many inspiring ways. One of the events which really displays the spirit of Pico Union Projects the best is the bi-monthly ¡Vida Sana! Community Wellness events held on the 2nd and 4th Thursdays of each month from 2:30pm to 4:00pm at the site of the Pico Union Project (get directions). Where we give away free fresh produce and fruits from the farmers markets, have arts and crafts for the children, host nutrition classes for adults, and connect people with community resources for the whole family. ¡Vida Sana! comes out of an outgrowth of the seasonal community resource fairs that PUP has hosted since it’s inception just a few years ago. Excited by the outstanding success of these events and moved by the great needs of the community we are part of, Craig recognized that we needed to hold these events more often. So back in 2016 I was sent out to ask the community what they felt they needed from our project. Among the most important needs expressed was that our local families wanted access to nutritious food and resources for healthy living. In Latino communities like this the rate of diabetes is at about 18%, which is over twice as high as in white communities. Many families are effected by this devastating condition, which is often exacerbated by limited access to nutritious foods and health resources to be found in this corner of the inner-city. For this reason Pico Union Project began to regularly focus our attentions on community wellness. One of the major successes of this program is the vision and enthusiasm of Craig Taubman, as well as his unique ability to bring diverse partners together to get awesome tasks accomplished. First, acquiring donations of unsold food from local farmers markets and partnering with friends of his to have it kept for us in refrigerated storage facilities they own until the days of our events. Thereby allowing us to give away quality fresh fruits and vegetables to our neighbors, all for free. Eliminating waste of this fine produce and feeding so many hungry families at the same time. Neighborhood children planting tomato plants in garden boxes built with the help of Seeds of Hope. He also built a wonderful relationship with Seeds of Hope, a ministry of the Episcopal Diocese of Los Angeles which works with congregations, communities, and schools, to turn unused land into productive and beautiful gardens and orchards that provide fresh and nutritious foods to areas of need across the county. They have come out to help us plant trees, fruits and vegetables in the neighborhood with the enthusiastic help of the neighborhood children. Seeds of Hope also provides nutrition and cooking classes, to discuss with parents how they can make healthier food choices, with fun presentations in English and Spanish which offer helpful tips to neighborhood parents on how to made tasty and nutritious dishes, often with the same fresh foods we are providing that day. They volunteers from Seeds of Hope are always thoughtful in providing recipes and culinary tips which are accessible and culturally appropriate to the people of our community, which are more likely to be incorporated into their lifestyle. ¡Vida Sana! even aims to provide fitness activities such as relaxing yoga and fun Latin dancing. Though it must be noted that these events also provide all kinds of ways of developing wellness, not just of the body, but also of the mind and heart. Our program has offered art, music, storytelling for the youth of our community. Engaging in arts and crafts with the children. We have even put together community murals with the permission of local businesses, enabling locals artists and youth to take pride and ownership of their community. And develop the creative skills and a sense of self-pride which can last a lifetime. …and this is just to make a few of our community partners. And our most important neighborhood partner is the Instituto de Educación Popular del Sur de California (IDEPSCA), which the most important Central American social service organization in the neighborhood; which is lifeline resource for the local residents, especially the day laborers, domestic workers and garment workers that live in this community. They have partnered with us since the very beginning, always stepping up to help us with even the most backbreaking of projects. However, the majority of the workforce for most ¡Vida Sana! events are volunteers from the public. People who come out with their temple, church or school to help us set-up and hand out fresh produce with us. And individual volunteers who engage in doing crafts and art project with our youth. And volunteers to help with planting fruit trees and flowers. Will you consider volunteering your time and resources to helping make a difference in the Los Angeles inner-city? Will you consider donating to this important cross-cultural, multi-faith project? Will you consider volunteering your energy and resourcefulness to make a positive impact in the lives of the people of downtown Los Angeles? CLICK HERE TO GET MORE INFORMATION AND TO SIGN-UP TO VOLUNTEER! Do you like the Pico Union model? 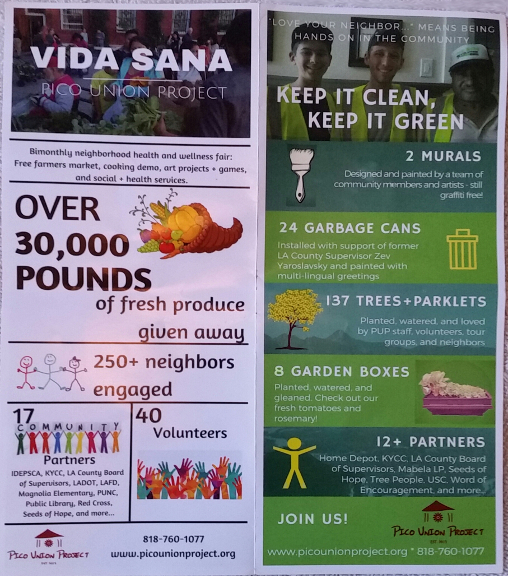 Do you have a community center, church or synagogue that you would like to host community resource events like ¡Vida Sana! ? The PUP model is inspiring people all over the city of Los Angeles to consider opening up their communal sites and religious space to utilizing this model project for the benefit of their communities. Let us know how we can help you get inspired and make this happen in your neighborhood!